One of Russia's largest banks has caught onto the global phenomenon (soon to be dictatorship) that is cats. In a new marketing scheme, Moscow-based Sberbank promises to send a cat over to your house for a couple hours if you sign a mortgage with them. That's right. They'll lend you some money, and then they'll lend you a cat! WHAT COULD POSSIBLY GO WRONG?! This neighborly campaign from the friendliest of all Russian banking behemoths is a ploy to cash in on Russia's mortgage market boom. According to the Central Bank of Russia, demand for home mortgages is on the rise. People "watch[ing] their savings lose value amid a sliding ruble and rising interest rates" are the driving factor, according to the Moscow Times. Cats, apparently, are the key for Sberbank cashing in. 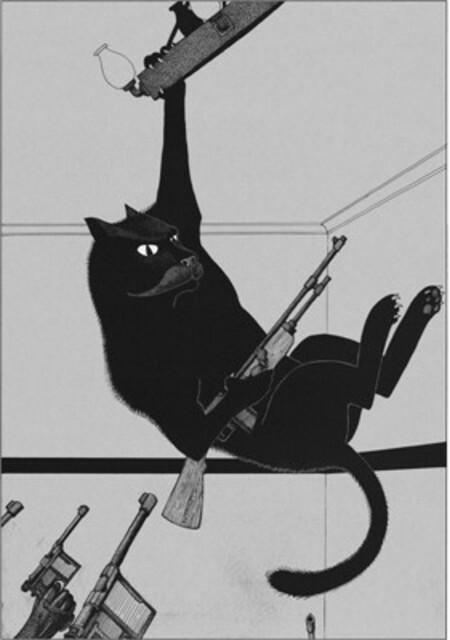 The cat promotion is actually pretty cool because cats (duh) but also because it plays into a Russian superstition. Apparently it's good luck for a cat to be the first creature to step over the threshold of a new home. The state-run bank even allows people to choose from ten different cats to come and bless their homes. So, knowing that I can have a cat for free for a couple hours, I only have two questions: will the Russian bank send cats to the US and also how the hell do you do a mortgage?